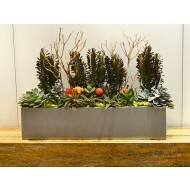 Incorporate plants into office environments and instantly add life to drab office cubicles. 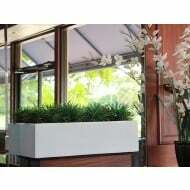 At NewPro Containers you will find a vast assortment of partition planters and desk top flower pots. 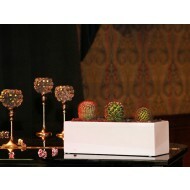 Choose from a variety of shapes including rectangular, square, round, and more. 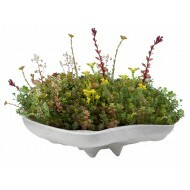 With many color choices available, you are sure to find the perfect pots to complete your interiorscape design. Studies have indicated that plants are beneficial in the workplace. 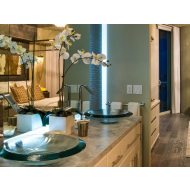 They improve indoor air quality, relieve staff stress, and cut down on the amount of sick days used. They are also thought to promote productivity, health, and wellbeing. 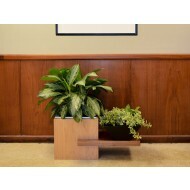 Installing cubicle planters can improve your client's plant / life balance. Happy customers are our favorite kind of customers! 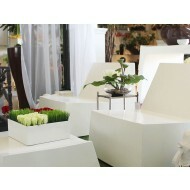 Partition mounted pots come in an array of colors to perfectly complement your client's existing office decor. Plus they don't take up precious desk space! Consider purchasing a pot with a sub-irrigation system, as this will give you more flexibility when it comes to watering. Mounting a planter in hard to reach areas, such as the top of an office cubicle, can make watering maintenance a difficult task. A self-watering system can help keep those plants hydrated for longer periods of time, making care hassle free. 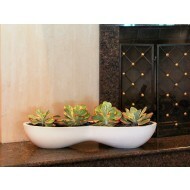 Most partition planters feature a flat bottom. Think outside of the cubicle and use these versatile planters as classic pots and place them on desks, windowsills, and shelves. 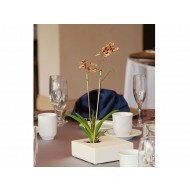 Use them in a restroom, a conference room, or wherever you want to add in an accent to an otherwise ordinary room. Don't forget to utilize smaller flower pots on available desk surfaces.